For many of us, as we start to say goodbye to summer, our future plans might include a concert in the park or another outdoor venue. It might be an oom-pah brass band at a fall beer-and-bratwurst festival or a large symphonic group on a summer night at a place like Grant Park in Chicago, but its hard to be anywhere in the United States where theres not a band of some sort. 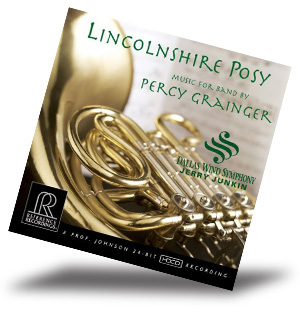 Percy Grainger (18821961) was an energetic Australian composer and extraordinary pianist who was interested in writing for varying combinations of instruments. He intended to have his music performed, so he scored for instrumentally flexible ensembles (what he called "elastic scoring") and arranged his pieces for many different instrument combinations. He also collected folk music using the best recording techniques of his day, and he incorporated so much of it into his compositions that its often hard to tell where the folk ends and Grainger begins. The recording is top drawer and correctly captures all of Graingers colorful scorings, including a veritable army of percussion, a properly spotlighted saxophone section, the plucked strings of the piano, and a thunderous, tightly focused bass drum. Its an audiophile delight -- even more so if you have the equipment to play the 24/96 download available at HDtracks.com. Bands have had to piece repertory together from many sources. There are original compositions, though not enough for full concerts, where bands must mix the unfamiliar and the familiar to attract an audience. Its not surprising, then, that a great portion of a wind symphonys repertory comprises arrangements from other instrumentations. Bach has long been a favorite ground for thrilling arrangement, and there have been many good ones. 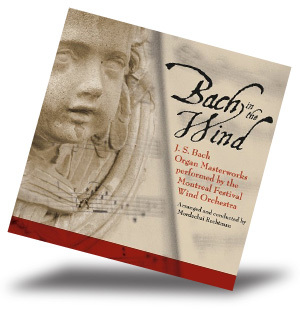 While I was at HDtracks, I came across a Bach arrangement program Id never heard, Bach in the Wind, with the Montreal Festival Wind Orchestra conducted by Mordechai Rechtman (****). Though I discovered it via a superb download (16/44.1kHz), the recording is also readily available as a CD from Marquis Music. The arrangements are all by Rechtman, who employs a "pure" instrumentation played by a 24-piece ensemble of flutes, oboes, clarinets, bassoons, horns, trumpets, trombones, tuba, and string bass (the only interloper). Notably absent, from a traditional band scoring standpoint, are saxophones and percussion. What this scoring gives us, however, is the closest sound possible to the organ, which is a wind instrument itself. Rechtmans scorings sound in the same instant respectful and innovative, and they make you think of the careful choice an organist makes in deciding which rank of pipes to use for a particular piece or passage. Having the lines played by different wind instruments opens up those choices, and there are some beautiful, mostly mellow sounds on this recording. The Canadian ensemble sounds thoroughly professional, and Rechtman, an Israeli conductor of wind music whos in demand all over the world, cuts to the heart of every piece without resorting to an overly emotional approach. He lets each magnificent work proclaim its own worth. The sound is expansive and resonant without losing clarity, and it has an impressive stage depth and adequately wide front stage. I found one surprise: theres no Toccata and Fugue in D minor here. Instead, youll find the Toccata, Adagio, and Fugue in C, the Fantasia and Fugue in G minor, the famous Passacaglia and Fugue in C minor, and other favorites. Though this must have been a live recording, theres no applause until the 15th track and final encore, the Little Fugue in G minor, and then its thunderous! The audience clearly enjoyed these performances, and theres every chance youll like this slightly different roots approach to Bach too. Moving to a composer who knew the monetary value of making his music available in a wide number of arrangements, we come back to the U.S. to Leroy Anderson, who received his start from Arthur Fiedler and the Boston Pops Orchestra. He rewarded that institution by providing a steady flow of exquisite, perky, and hummable three-to-four-minute tone poems, which are still played at Pops concerts. Anderson knew that for his music to be successful outside of Bean Town, he had to make the pieces short enough to fit on one side of a 78rpm record (remember those? ), and he had to make them available in both band and orchestral arrangements. But Anderson didnt just transcribe his music for band by giving the violin lines to the clarinets and the cello parts to the euphonium; he often reassigned them to sound best for winds. Since the pieces take on a slightly different (but no less delightful) character, theres a need for a good collection of this music played by a crackerjack band. 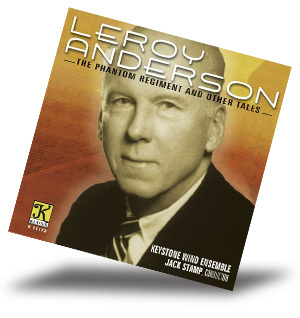 For the most part, Leroy Anderson: the Phantom Regiment and Other Tales, with Jack Stamp conducting the Keystone Wind Ensemble (Klavier CD K 11172 ****), fills the gap admirably. Anderson wrote all but three of the arrangements it contains, and though the band isnt professional -- its players are students and staff associated with Indiana University of Pennsylvania -- it maintains an astonishing level of professionalism. Stamp always seems to pick the right tempo, and he pays close attention to the rhythmic elements of any piece he conducts. The opening Buglers Holiday is exhilarating; Blue Tango is sensuous; four movements from the Irish Suite are spirited; and the rest, including Belle of the Ball, Serenata, A Trumpeters Lullaby (written for Roger Voisin), A Christmas Festival, and more, are just about as appealing. The Christmas Festival for band is a little shorter than the orchestral version, providing a good example of the composer rethinking his music for the medium. The sound is warm yet bright. Recording engineer Bruce Leek has a long history of recording band music for Klavier, but this time the bass line is at times a little muddy, leading to a lower rating than the recording might have received. On the other hand, the highs are delightful, and theres some really successful and fun stereo panning of the sandpaper blocks in Sandpaper Ballet. Id recommend that you look into the near definitive Leonard Slatkin collection of Anderson, a recent multiple-disc series released on Naxos, and then supplement those recordings with this disc. If you follow our expert audio reviewers advice, you should have audio equipment that will let you experience the subtle differences between two versions of an Anderson gem. Speaking of Naxos, that company now has its own successful series devoted to wind band music. Instead of using one ensemble, the conglomerate has scoured the globe to find good bands and wind ensembles from just about everywhere, often in surprising locales. Id have never imagined the University of Georgia Wind Ensemble standing tall in the company of the other stellar ensembles above, but it does. (Then again, Atlanta has one of the best symphony orchestras in the U.S. and perhaps even the world.) 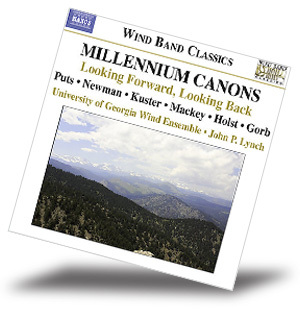 The CD is called Millennium Canons: Looking Forward, Looking Back and is conducted by John P. Lynch (Naxos 8.572231, ****). This disc contains music that was originally written for band, with composition dates ranging from 1930 (Gustav Holsts Hammersmith: Prelude and Scherzo) to 2008 (Jonathan Newmans My Hands Are a City and Kristin Kusters Lost Gulch Lookout). Actually, the Holst is the only "old" piece -- the next in line is Adam Garbs 1996 Awayday -- but Holst was often a forward-thinking composer and his music fits right into this concert. The albums title composition, Millennium Canons, was written by Kevin Puts in 2002, and its overlapping tones create a shimmering and immediately appealing resonance. The second part of John Mackeys Kingfishers Catch Fire creates a remarkable image of the birds dashing about as shafts of sunlight catch their wings and reflect on the water. Awayday is perhaps the best-known work on this CD, and it gets just the sort of high energy, demonic reading it needs to be highly successful. According to its composer, "If you can envisage George Gershwin, Leonard Bernstein, Igor Stravinsky, and James Bond traveling together at a hundred miles per hour, I think youll get the idea." As indicated above, the playing is splendid and absolutely first rate, in both the ensemble and the solo passages, and the recording, produced by Bradley Genevero and Andrew Trachsel, is clean and sonorous with great presence, whether the musical passage is tinkly or tumultuous. Another benefit of this recording is the low Naxos price! So there you have it: my goodbye to summer. It might be January, and the winds of winter could be tugging at your shingles and window latches, but you can pull out these recordings, sit back, and let the warm winds of your favorite band play on any time you like.